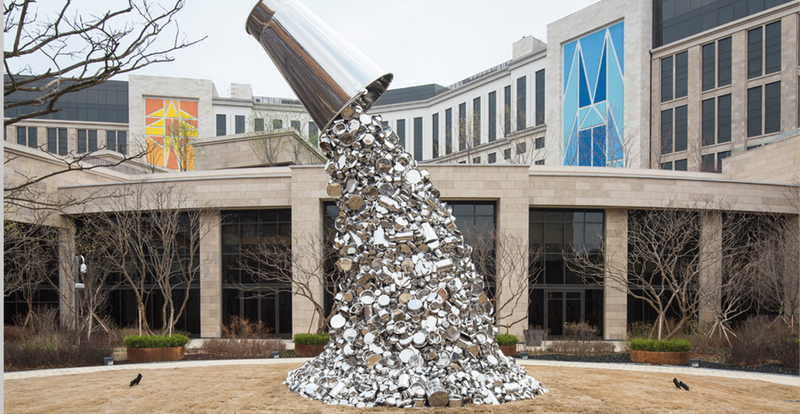 This work clarifies Subodh Gupta’s solid value by which “what is the most routine is the most sacred.” Stainless steel kitchen utensils that do not absorb water unlike earthenware can be found in every household in India in pursuance of the Hindu proposition that “the unclean is easily contaminated.” Their quotidian and religious symbols signify the present state of India that is particularly marked by rapid economic growth and Westernization, unmasking the influence of values and systems on human life. Born in Bihar, India, Subodh Gupta studied painting at the College of Art, Patna. He currently lives and works in New Delhi. His works have garnered attention at numerous major international biennales. He has held a number of solo shows in Asia, Europe, and America. He has represented Indian life, culture, and contradictions with dramatic monumental sculptures using images symbolic of Indianness and readymade objects.